Oman is the kind of destination that will surprise those not well versed with the Middle East. 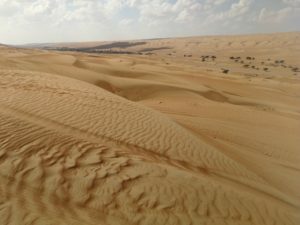 If you think Oman is just another desert country with not much more than a lot of camels, a lot of oil and a lot of sand, then prepare to be surprised. Muscat is the capital city and while not a tourist hub, there is enough to do and see in the Omani capital to make it worth a night or two’s stay, or as we did, use it as a base from which to explore the country’s northern areas. Before heading out, we decided to take in the sights of Muscat and the tour began by visiting the Sultan Qaboos Grand Mosque. 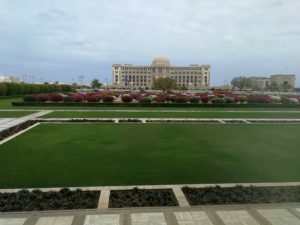 It’s an impressive building with a beautiful surrounding garden and on the other side of Sultan Qaboos Avenue, you can see the various government ministerial buildings as well as the Supreme Court. We also visited the Bait Al Zubair museum. Although no photography is allowed inside, it is a nice opportunity to get an idea of Omani history, culture and art. I particularly liked the display of old postage stamps and currency bank notes from different countries Oman did business with in the old days. Mutrah is a hive of activity. 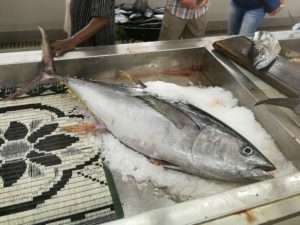 The fish market offers the opportunity to watch fishermen bring in the catches of the day and chop up the marine life before your very eyes. You can of course also make a purchase. Just opposite the fish market, is the fruit, vegetable and nuts market. 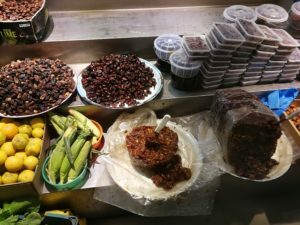 We were offered a variety of different local dates, which I recommend, as well as fresh home-grown produce and imported foods too. We bought some dates and bananas before exiting and marvelling at the nearby mountains that overlook the harbour, making for a stunning view. The sultan’s ship happened to be docked at the port making for a great photo opportunity. After taking that in, it was time to cross Al Bahri Road on The Corniche to visit the Mutrah Souq. A souq is a traditional Arabian market place. I’ve been to souqs (sometimes spelled ‘souk’) in Tunisia, Morocco and Qatar, so I’m quite used to it, but each souq is also unique. It’s not a case of having seen one, meaning you’ve seen ‘em all! What the Mutrah Souq does have in common with others is that it offers a plethora of shops selling food, clothing, perfumes, souvenirs and of course every shopkeeper swears they are giving you a discount and a better price than their competitor. In the United Kingdom it is possible to visit Buckingham Palace and take pictures outside the palace’s gates. In other countries this is not always a possibility. In Oman there is a good middle ground that boosts the tourist experience. 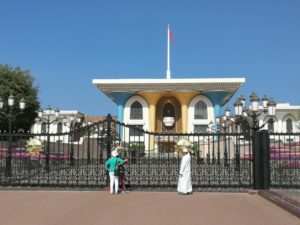 We were able to visit Sultan Qaboos’ palace in Muscat. The beautiful Al Alam Palace is a colourful building of interesting architecture that was well worth the stop. You can also explore the palace grounds. On either side of the Al Alam Palace you can see the 16th century Portuguese forts Mirani and Jalali, although you cannot visit them. There are forts all over Oman and from a watersport perspective plenty to do as well but since time was limited, we opted for alternative activities. One of these was a trip into the desert. About a two-hour drive from Muscat, you’ll find what is known as the Wahiba Sands. Ever since my first visit to the Sahara Desert I have loved these sandy wildernesses, especially the dunes. Who wouldn’t? After a bit of dune bashing we visited a Bedouin home. The Bedouins are a nomadic desert tribe found throughout the Middle East. We were invited inside by our gracious hosts. Ntando had a henna painting done on her hand by one of the locals while I enjoyed Omani coffee and dates. After touring the home which is made up of several rooms in a tent-like structure, we thanked our hosts and Ntando made time for a quick photo opportunity with one of their camels. Camels are actually two-humped, while the variety with one hump are called dromedaries, who make up more than 94% of the world’s camel population. For the purposes of this piece we’ll just call them camels, even though my insides want to eat themselves because it’s obviously erroneous. We also visited the beautiful Wadi Bani Khalid, an oasis among the barren and dry desert. Oman is full of wadis. A wadi is an Arabic term referring to a valley. 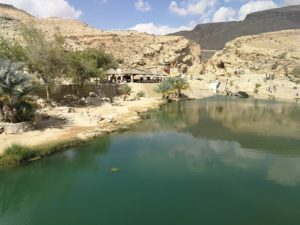 The wadis of Oman really are worth visiting and Wadi Bani Khalid’s water is a turquoise-like colour similar to what you see at the Big Hole in Kimberley. We made sure to take plenty of pictures and videos and then I got up to one of the higher points just simply to admire the view. Later, when we went to the southern part of the country, something that was very much on par was the Wadi Darbat. 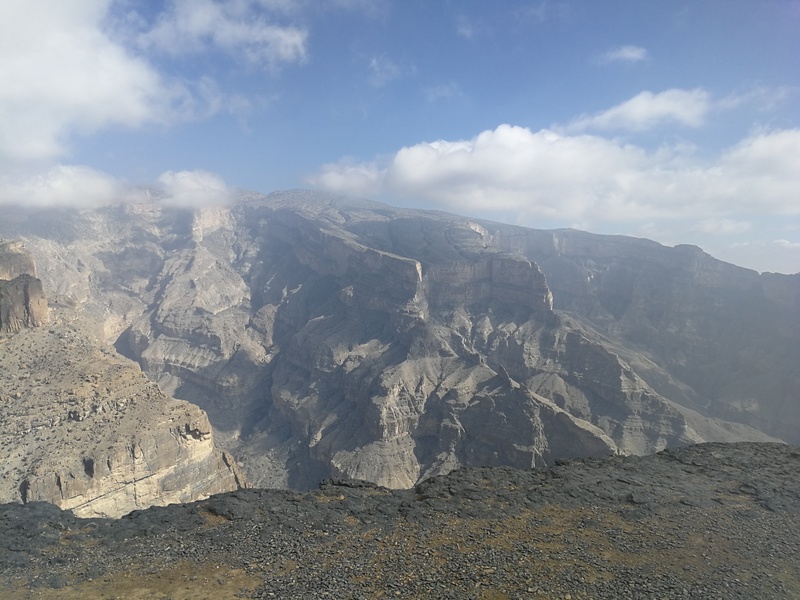 Just like Wadi Bani Khalid, the scenery is totally worth the visit. We spent our fifth wedding anniversary high in the Jebel Shams. Jebel is the Arabic word for mountain – or at least I hope it is. My Arabic-speaking friends, I ask for forgiveness if I’ve said something “haram” here. Jebel Shams is glorious. I doubt I have the vocabulary to do it justice. After twisting and turning up the mountain range we stopped at a point that is 2 700 metres above sea level. The highest peak is 3 100 metres. 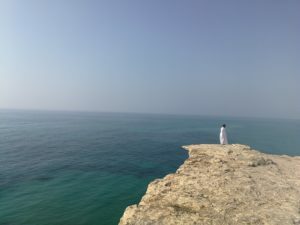 The point we stopped at is one of Oman’s true treasures. They call it their Grand Canyon. I have not been to the United States’ version, but this was nothing short of spectacular. Mrs Stemmet agreed that viewing this Grand Canyon was the best way to spend our wedding anniversary. In fact, she even said it was our best anniversary activity to date. Now that should tell you how spectacular the Grand Canyon is. Much like at Wadi Bani Khalid, I took a few minutes to just stand there and appreciate the splendour but to be honest, I needed hours not minutes. I hope my photos and videos do it justice. Al Hamra is a charming oasis village where we visited an old restored house functioning as a museum today. The female curator showed us around and took us to a downstairs room where two women demonstrated how they used to make their coffee, bread and pottery in the old days. 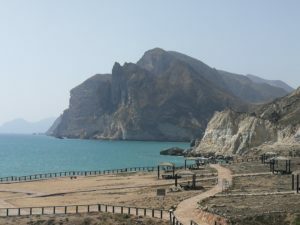 After four nights in Muscat it was off to Salalah, the country’s second city and a must-see for tourists, we were told. Now it was our turn to see for ourselves. It is worth noting that we found Muscat to be an expensive place and this was also true of Salalah when it comes to hotels and taxis. In the case of the latter the rates are negotiable but since it was obvious that Ntando and I are not Omani, they were quick to inflate their prices. We simply refused. Imagine paying five times an average Uber rate for a public taxi trip! Our hotel in Salalah was the Crowne Plaza, complete with a balcony overlooking the wonderful swimming pool, garden and beachside restaurant and stunning beach. We explored the city itself by visiting the Sultan Qaboos mosque as well as his residence in the city. Both were nice archaeological sites to see but not as impressive as the Muscat versions, which you might expect considering Muscat is the capital. We also popped into the Al Baleed museum, where we took in some Omani naval, political and flora history. We drove through the Garden Farms witnessing the banana trees, coconut palm trees and papaya trees as well a fierce-looking swarm of bees. We stopped roadside to enjoy some papayas, bananas and coconuts, but not any honey. I enjoy coconuts and the riper the better. The hairy variety you find in supermarkets are nowhere near as ripe, so it was an absolute pleasure to enjoy fresh coconut water and flesh in Salalah, in the heart of the Dhofar region, the Middle East’s largest coconut producing region. We also popped into the Al Husn souq where Ntando’s excellent negotiations once again ensured a good few bargains. This souq is also considerably smaller than the one we visited in Muscat. When we headed further east of the city we stopped at the previously mentioned Wadi Darbat and also the quaint Taqah area where we stepped inside an old castle previously occupied by the local leaders. There was also a quick stop at Taiq, a deep sinkhole among many others found throughout the Salalah mountains, or Jebel Sanham. The stunning views were rivalled only by the mountain range we would drive through when we explored the areas west of Salalah. But on this occasion one of the highlights was an extraordinary stop at what is called the Location of Gravity. Our driver stopped the car, put the gear lever in neutral and suddenly we began to slide … uphill! This phenomenal occurrence is a tourist attraction of note as you can imagine. How is it possible to slide uphill? Our Omani driver’s best explanation was that it could perhaps be an optical illusion. I had a good look. I had my glasses on too. We were sliding uphill. On our final day in Salalah, we headed west. As we made our way through the stunning mountain range we stopped along the way to see camels in the wild and frankincense trees. Oman is pretty much Frankincense Central. The dramatic mountain scenery was rivalled only by our stops at two magnificent beaches. The first was at Al Mughsail and the second was the Fizaya beach. Both are stunning with their white sands and turquoise waters. We also saw local fishermen at work and flocks of seagulls everywhere as we just marvelled at the surrounding mountain ranges. 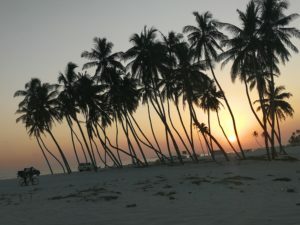 To make a comparison, the region west of Salalah has many similarities to the Western Cape in South Africa. As we headed back to our Salalah hotel, we made our way through the Zig Zag Road in the mountains and just loved the breathtaking views of the Arabian Sea on one side, and the mountains on the other. And then it was all over. It has been said that Oman is the jewel in the Middle East’s crown. While I haven’t been to all the countries in this region, for now at least, I cannot argue. Oman is truly outstanding.